Elmlea is committed to using sustainably sourced palm oil. Unilever is committed to sustainable palm oil. 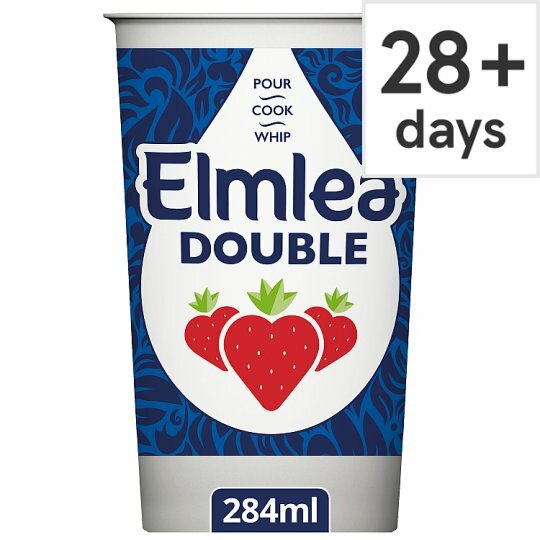 Elmlea Double is perfect for pouring, whipping and cooking. Use with your favourite dishes for a deliciously creamy taste. Elmlea is a blend of buttermilk and vegetable oils that is suitable for vegetarians. Elmlea can be poured, whipped or cooked with dependent the dish. Weather your making a sweet or savoury dish Elmlea has a wide variety of products that are suitable, easy to use and deliciously creamy. Elmlea last longer once opened so can be stored in the fridge to bring together leftovers or used again and again for indulgent deserts. Add a whirl to your soup, whip it up for pudding or spoon over your pasta sauce of steak for a deliciously creamy sauce. For delicious recipe ideas and more information about Elmlea you can visit our Facebook page Elmlea UK and follow us on Instagram @elmlea_ukie. Not suitable for freezing., Keep refrigerated and use within best before date., Do not freeze., For expiry date see lid. Whip it up for dessert, pour over pudding or stir in to further enrich your cooking.